PRODUCT: SAFETY STAND T-TOP POST, 42" T-TOP POST (48" OVERALL HEIGHT INCLUDING T-TOP) x 4" DIAMETER POST WITH 2 REFLECTOR BANDS. PRICE/EACH. Email for special freight rates on large orders. Standard with molded lower handhold grip. Molded-in bolt-hole for optional flashing light (and a new longer handgrip area). Two bands of reflective material. Stronger ribs provide maximum band protection. T-top precision molded for consistent, high quality parts. Bases are Manufactured with minimum 45% recycled rubber. Posts are Blow Molded HDPE with about 25% recycle content. Also available in pallets. 200/Pallet. 48x48x96 size. 500-lbs. Safety Stand Base Weight, 12 Lb. 12 LB. HEXAGONAL SAFETY STAND WEIGHT / BASE. FITS 4 in. DIAMETER SAFETY/DELINEATOR POSTS. Email for special freight price on large orders. Safety Stand Base Weight, 18 Lb. 18 Lb. Hexagonal Safety Stand Base / Weight. Fits 4 in. 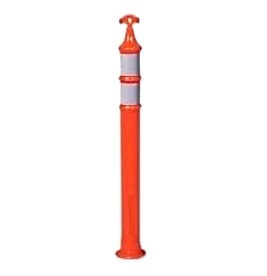 Diameter Safety Stand (delineator) Posts. Price/Each.